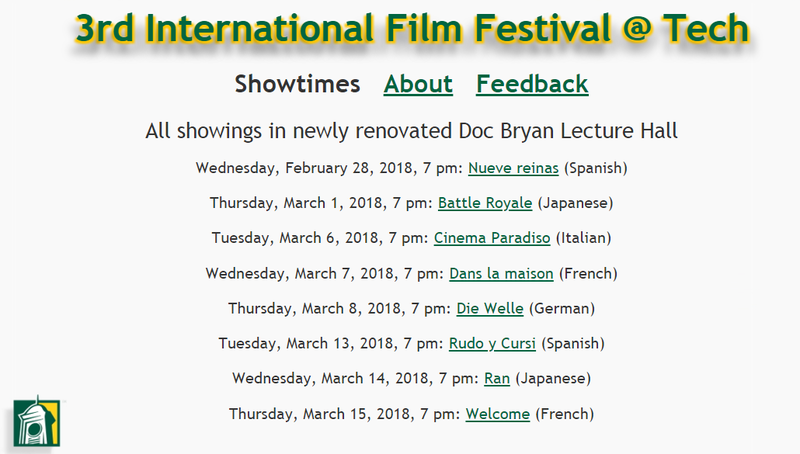 The 3rd Annual International Film Festival kicks this Wednesday, Feb. 28th, with a showing of the Nueve Reinas at 7:00 P.M. in Doc Bryan Lecture Hall. Nueve Reinas (Nine Queesn) is a 2000 Argentine crime drama centering on two con artists who decide to pull off a major scam in stamp collecting. The film won 21 awards and is considered a classic of Argentina’s film history. The screening Wednesday night is the first in a month-long celebration of films from around the globe. The purpose of the festival is to foster an open-minded global cultural identity. The film festival is sponsored by the Ross Pendergraft Library and the department of English & World Languages. Principle organizers include Dr. Nelson Ramìrez, associate professor of Spanish, Coordinator of World Languages; Dr. Lowell Lybarger, multimedia librarian and instructor of music; and Philippe Van Houtte, systems librarian and instructor of French. Each film is registered as an OnTrack event. For a full schedule of showtimes, visit our website at http://filmfest.atu.edu. Each film begins at 7:00 P.M. in Doc Bryan Hall and is free to all. For more information about the film festival, contact Philippe Van Houtte at pvanhoutte@atu.edu.